"Spock ... help me ... Spock." This week I received a buncha invites to try Spock, which I'd sort of been avoiding simply because I was so buried by other life events. But Sunday morning I felt the Jones to fill out forms and go through another web 2.0 process. Here is my initial response to Spock. 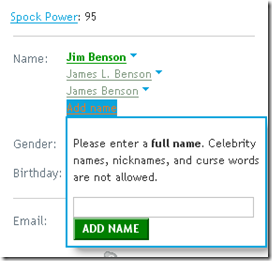 Spock gives you lots of tools to have robust data and then doesn't allow you to use them. The biggest part of this for me is the box to the right. My name is Jim Benson. There are 80 Trillion Jim Benson's out there, or so it seems. If people search for Jim or James Benson, they have a hell of a time finding me. But everyone who knows me knows that I'm "ourfounder" on just about every social site out there. 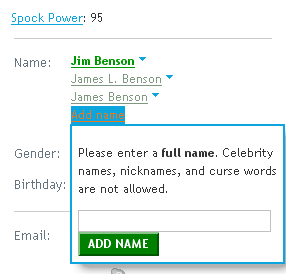 But I cannot enter "ourfounder" in this box because it is not a full name. But, you know what, it is a primary identifier of me. Yes, Ms Silkcharm. Allowing her to be findable. I tried "Ourfounder Ourfounder" and it said "That does not appear to be a real name". Which makes me wonder if the large number of repetitive African names can be used in Spock. Laurel had a larger fight with Spock over her imagery. Part of her personal brand is her avatar / logo which they would not allow as a real picture of her. (For some reason the Second Life shot you see here stayed). 2. What the heck is my trusted network? This is really confusing. The point of Spock is for you to build trusted networks and organize people you know into groups. But, you cannot view your trusted network. This is so bizarre that I spent about an hour just searching over and over for it. There is a Network button, but it shows you everyone in your extended network! While I was working on this, other people joined my trusted network. But I didn't know - because I have no way to actually track my trusted relationships. They give you an "advanced" search, I thought maybe it would be here, but no. Again, here, "Network" means your trusted relationships and everyone they know. So I have dozens of pages of people in my Network that I do not know. If I am bothering to trust these people, it would be nice to be able to see them. 3. At last! I can manage my network! Sort of. On your front page is a tool to list people you respect and to tag them. Wonderful! But ... where do these people come from? Off the top of your head. There is no pick list. No ability to view your trusted network and select people for this treatment. You just start typing names. This sort of freaked me out. I linked my page to Ed Vielmetti's ... but he hadn't even been on the site. As you can see at the bottom here, it asks me to Invite Ed ... so that Ed can claim his own information. I'm sure others will write long bits about this. For Ed, this was fine. Ed is an old pro at all things social software. But for my other friend Bob, he represented on Spock because Spock went out and scraped his myspace page - a page not updated in quite a while. So, because of this I thought .. wow, they must have a bunch of pages for me. And I went searching. Two more Jim Bensons and one James Benson pages that had my information in them - amongst hundreds of other Jim Benson and James Benson pages. But for my own personal identity management, I had to chase these pages down and claim them. I had to actually sit there and sift through their database in a very coarse way to gain my own personal information. That wasn't fun. At least if you are going to make me work, give me better tools. But having to search their scraper-results to clean up my on-line identity is worrisome. There was also a lot of effluvia from other Jim Bensons in my real profile that I had to disavow. This information also came from their scrapers. What we see here is that search engines and scrapers are too coarse to build identity profiles for third parties. That's the easy part. The ethics of scraping and claiming that's a profile for a person ... that's harder. Requiring a rigid level of data input from users (photos, names) while having a frivolous data collection method is just plain bizarre. Spock looks like it could evolve into a very useful tool. But they'd better watch out that they don't alienate everyone before they get there. I'll happily not join this system, and wait for it to coarsely scrape all sorts of data about me and get it wrong. Spock don't do search very well - I tried to add a relationship to a few people but they didn't show up on search. They could send me the direct link to their page - usually your firstname-surname-andsomenumbers but no way could I enter the relationship the way they wanted me to. I tagged myself with the name of my high school. Spock tagged me with "business consultant". I had a moment of clarity and decided I probably don't need every random I meet at a conference to know where I grew up, but couldn't take the tag off. 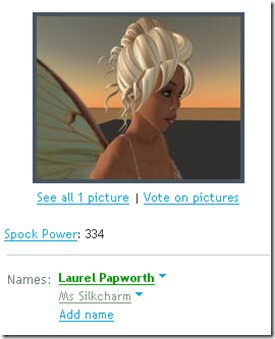 I had to report my own self to spock. "Dear Sirs, I tagged myself Lowell High School, but I don't want that to be known about me. Please remove." Bizarre. I'm still a "business consultant" because all I did was vote against that tag. One of the things I like about Spock is the fact that you can mark duplicate results for merging. If you have multiple results for a search for your name, you can click the Merge Duplicates link at the top of the results. This will turn on check boxes you can use to recommend results to be merged.